class="post-template-default single single-post postid-7365 single-format-standard samba_theme wpb-js-composer js-comp-ver-4.1 vc_responsive"
During my freshman year of college, I was constantly strapped for cash. It wasn�t like I was poor�money had been set aside for my first semester that was to be used for food and books�but my mother made the mistake of telling me that I could spend whatever money I had left over at the end of the semester however I pleased. So I didn�t eat or buy most of the books I needed for classes, and at the end of the semester I bought a guitar. Second semester I was on my own. Before the start of my sophomore year I transferred schools. A friend gave me the idea to start writing music reviews for the school paper. I was told that I could contact any record label I wanted, and when I told them I was working for a school paper they would send me any new album I wanted�for free! It seemed like a brilliant idea. I was a strong writer�I�d just changed my major from Computer Science to Communications and English�and working for the news media would be a perfect role for me at my new college. The first label I contacted was Touch and Go; I had heard that they were generous with their press links and could get me into shows, set up interviews, and prepare me with any new addition to their catalog�so I sent in a very long and rambling letter in a cocksure tone, trying to sell myself as the next Lester Bangs. A kinder response than I deserved came from Chad Nelson, who for the next three years helped me in so many situations that I actually ran out of ways to express my thanks. He was the person who got me in touch with Jeff Mueller. I�d first heard June of 44 as a freshman in college, and was fascinated by their sound. Then when I heard Shipping News, the music worked its way under my skin and drove me wild. I would write about those bands countless times for different publications, hailing their songs as brilliant exercises in controlled catharsis. Three-Four and Flies the Field feel like at any moment, a track might explode in noise and just pummel the listener. The songs keep you waiting for the crescendo, assuring you that at any moment things will fall apart. Sometimes, it just won�t happen. My heart races in anticipation and I�m left wanting more after every song. It�s thrilling. From the first time I heard June of 44 I knew I had to discover everything I could about these artists. The band members� resumes read like a Who�s Who in independent rock music. The basic bands would be Rodan, June of 44, but these projects branch out and encompass a seemingly endless list of bands. Tara Jane O’Neil, The Sonora Pine, Rachel�s, Codeine, Rex, Lungfish, Naysayer, The Crownhate Ruin, Just a Fire, The King Cobra, Directions in Music, Retsin�On some nights, I would sit staring at a blank Microsoft Word document, trying to write an article or an assignment, and I would start playing connect-the-dots with all these bands and their members. The lists would go on for pages. All these talented people are integral to the landscape of modern music. From Louisville to Chicago to New York and all places between, those who have contributed to these projects�regardless of whether they are aware of it or not�have helped enormously to shape the future of independent recordings. Before Chad Nelson left Touch and Go, he helped me with my largest request�he put me in touch with Jeff Mueller and scheduled a meeting for us while I was in Chicago. Along with my friend and hostess Jet, Jeff and I spent a perfect evening in July drinking and conversing about everything from childhood to parenthood, the city of Chicago and beyond, his experiences and predictions for the future. Tuman�s is on the corner of Chicago and Leavitt, in a three-story red brick building located next-door to Muzyka and Son Funeral Home. There�s a large �Old Style On Tap� sign gracing the fa�ade. The sun is setting. I open the front door into an antechamber and am greeted by a set of wooden batwing doors. I push my way through, letting them swing shut behind me. I�m looking for an unfamiliar familiar face. Slunk over the bar, a guy with greasy black hair and a tattered white t-shirt shifts his position to raise a guarded eye in my direction. 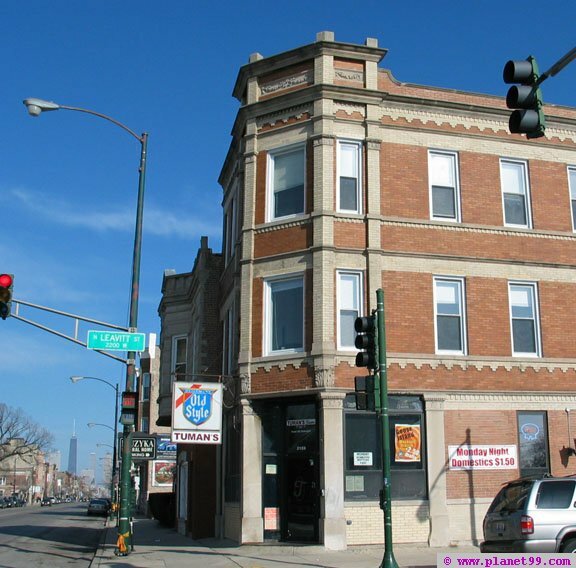 In 2001, Chicago Citysearch voted upon this place�the Alcohol Abuse Center�as being the best pick-up bar in the city. Its doors closed in 2003 only to open again, renovated and under new ownership that brought a sacrilegious shift in attitude that subsequently left many former regulars yearning for the depravity and brutal rawness this venue once offered. Whereas Tuman�s once catered to all walks of life�misanthropic artists and booze hounds, addicts and unsuspecting suburbanites�professionals and yuppies just getting off work are congregating in nooks, socializing and nursing drinks. Other than the gritty guy at the bar, the smattering of bodies this evening look out of place in this hallowed dive. I step outside onto the patio, the sun is setting and I take a seat at a table adjacent to the bar�s brick exterior. There are maybe ten tables in this fenced-in space. It is quiet now. Only three tables are occupied. I�m talking with Jet, waiting for Jeff Mueller to arrive. He walks down Leavitt towards the bar�s entrance; all wiry, dressed in black pants and an olive-green collared t-shirt. His hair is brown and untamed. He has a long face, a high forehead and a prominent nose. The slightest hint of stubble covers his face. When he finds his way to the patio, he asks, �Evan?� And I nod and stand to introduce myself. He sits down and instantly launches into a brief history of Tuman�s. �Yeah, I saw that sign,� I comment. �When did you move here?� I ask. Jet and I don�t mind. We�re rolling our own. Jeff removes a pack of Reds from his shirt pocket and fishes for a cigarette with his thumb and index finger. He flicks a black plastic lighter and takes a drag. �So, yeah,� he begins. �Who have you talked to so far?� He holds the cigarette between his index and middle finger and rests his arm on the table. As he exhales he looks upward and exhales the smoke into the fast-approaching night sky. A waitress comes by to take our drink orders; a Guinness for Jeff, and a Sierra Nevada Pale Ale for myself. He takes another drag, slow and long, and exhales off to the side. �Tim�Tim was kind of cool�� I trail off, uncertain how to answer. �Yeah, a little�� I try to stifle a nervous laugh. �So this all pooled together and inspired you to start with Rodan?� I ask. �I think a band like My Morning Jacket is vastly different from what, normally, people expect to come out of Louisville,� I note. I haven�t noticed until now, but it�s dark outside, the lights have come on, and the patio is filled almost to capacity. Two waitresses rush back and forth between tables taking orders and seeing that everyone is satisfied. The blonde looks harried; the brunette seems more reserved. Jeff reaches down and pulls his chair closer to our table. The young professionals behind us are laughing and screaming, and Jeff looks visibly affected. After we both half-turn to catch a glimpse of the commotion, we pause for a moment and drink from our pint glasses. �Was it easy moving from, as you said, an �island� to a sprawling metropolis like Chicago?� I ask him. At this point the table behind us erupts in laughter and cheers. Jeff looks over his shoulder to see what the commotion is about. There�s one kid in particular whose machine-gun laugh draws all of our ire. Jeff looks to Jet and then to me. We all agree that this is in order. We grab our drinks and move down to the other end of the patio. As we rise from our seats, the kid looks up and watches us momentarily before interjecting a trite one-liner that draws some hoots from the table of yuppies. Once we�re at a safe distance, Jeff wastes no time lashing out about the kid. �What can you do?� I innately respond. �When you moved to Chicago from Louisville, did you find that there were more venues in which to perform?� I ask. �I�ve heard things that it has to do with the management at Metro�is it more about that, or is there a problem with the room itself?� I ask. �I�don�t�think so?� I say, hopefully. �Would you classify Steve as an �elder statesman of the community� as far as the independent music scene is concerned?� I ask. �Do you think Chicagoans are culturally aware?� I ask Jeff. At this point I�m feeling a little speechless. Jeff notices and takes his theory a step further. � And the bureaucracy probably encourages it,� I posit. �I think that�s been sort of a long-standing stereotype of the area,� I say unsurely. �Well, maybe what I was pursuing heavily, like, ten years ago, I feel that way. I was out every night going to see bands all the time, and doing as much of it as I could because I was�and still am�entirely interested in all this. I mean, I�ve got a baby. It�s a fantastic and beautiful thing. I want to stay at home and see what he�s doing,� he says, smiling. �The impressionistic youth might find that to be a depressing and harsh reality,� I point out. �To keep the, I guess you would call it, the depressing aspect of job-working in the margins, as opposed to taking up the majority of space in your life,� I say. �And you foresee that happening�you see your building being torn down?� I ask. �Well, Unwound doesn�t,� Jeff points out. �Hmm.� I start to think about it a bit more deeply. �More like�Brat Mobile?� he suggests. �Yeah, that�s a good one.� I should have said that first. �Sexism in music, and sexism in general,� he agrees. All that stuff, it kind of became exactly what it was kicking against. It became cutesy, and it became a magazine�or pretty much all these magazines, and products that have no�� He drifts off. �The way you�re describing it reminds me a lot of modern punk-rock and what it means to be punk today,� I say. �The minute people lay their eyes on you, you�re doomed. They�ve sized you up, they�ve classified you, you�re in a genre, and there�s no way out of it,� I decree. �Don�t forget the rap!� I remind him. �You had to be really patient to get through them,� he finishes. �Metroschifter and Kinghorse,� I add. �It was kind of like Suburbia. It was pretty good�� Jeff stops and looks down at the watch on his wrist. �I�m sorry, have I kept you long enough?� I ask him, suddenly realizing how long we must have been talking. He rises from his seat and we shake hands. Before taking off, he gives Jet the address for his letterpress business and invites us to stop by, since tomorrow we�ll be at Grant Park for the Intonation Music Festival. I tell him I�ll give him a call, and, as quickly as he approached hours ago, he glides through the gap in the fence and disappears. I sit down at the table and break down my tape recorder. I lean back in my seat, glance over at Jet, crack a smile and rub my eyes. It�s been a long night. I look around, the tables have changed and the people are dressed differently than they were three hours ago. Around the corner, on Chicago Avenue, the traffic has slowed. We rise from our seats and head out the front door, getting maybe ten feet down the sidewalk before I realize that we never paid our bill. �I don�t think so,� she answers, but she hadn�t had anything to drink and hadn�t really kept track of it. In my mind it’s almost more embarrassing to walk back inside and admit I walked out without paying than it is to keep going at this point. That’s the crippling neuroses that runs my life. Do I look an an idiot for walking out without paying only to return and admit it, or do I just walk out without paying? I make up my mind, and my pace quickens as we slip away from the Alcohol Abuse Center. As we�re nearing Jet�s car, I hear rushed footsteps and I freeze momentarily�is it our waitress? But I look up and it�s Jeff. �So�are we just bailing?� he asks, looking amused. Tumans was the best. Great jukebox, awful bathrooms, crooked pool table, and $2 Guinness. It was a tragedy what they did to that place.